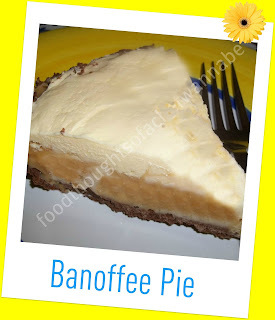 Banoffee pie (also spelled banoffi, orbanoffy) is an English pastry-based dessert made from bananas, cream,toffee from boiled condensed milk (or dulce de leche), either on a pastry base or one made from crumbled biscuits and butter. Some versions of the recipe also include chocolate and/or coffee. My opinion is, any pie that contains a softened toffee, banana's, chocolate cookies/crumbs and pastry cream, HAS to be amazing. I took the easy route with this version and honestly, it is the best version I have made to date. I hope you enjoy it as much as my family does. It is SO easy and so good. Put your can of sweetened condensed milk into a pot of simmering water. Simmer it for 2 hours. Do NOT let the water run dry or you risk your can exploding. You don't need to get all crazy with it, just let it simmer or low boil When the 2 hours is up, remove the can from the water and let cool completely before opening. When you open it, it will be soft gooey caramel goodness. With bananas, follow with caramel and then pudding mixture! This pie is so good. Let me tell you a secret. If you don't care how it looks, refrigerate it for a couple of hours and eat it that way too. It is not pretty but, oh, em, gee. It is delicious. Either way you are going to love it. I promise!! Wow, this blog is sort of a mess eh? Well, your going to work with it guys, it is how my mind is thinking today! Make BANOFFEE PIE!!! OMG I had to threaten my husbands life because he wanted SO BAD to eat it right out of the can after it was caramelized. I sent him out of the kitchen and then snuck a taste myself. MWwaaahahaaha!!! Do try it, it is SO good, I promise!! Thanks for reading!